Cut the ham long strips. Rinse thoroughly and dry cabbage and chop finely. Clean the peppers from the tails and the seeds and cut into fine strips. Wash and clean from the tails cucumber, cut into strips. Washed tomatoes cut into thin slices. 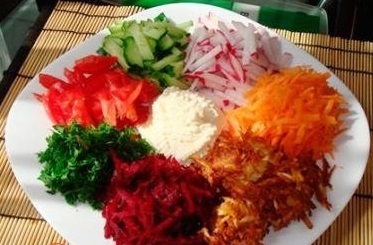 To prepare the filling mix chopped greens, mayonnaise and sour cream. Serve the salad must be laying on a flat salad bowl all the ingredients so that they were in a circle - ham, cabbage, pepper, cucumber, tomato.